An 80-year-old monk has been sent to prison for 15 months for sexually abusing boys at a Roman Catholic school more than 30 years ago. Ordained priest William Manahan pleaded guilty at Exeter Crown Court to eight charges of sexually assaulting pupils. The offences happened at Buckfast Abbey Preparatory School in Devon between 1971 and 1978. The school later closed. Judge John Neligan said the victims had been groomed and were "too young, innocent and bewildered to complain". The offences only came to light in 2006. The victims were aged between eight and 13 when the assaults took place. The court heard Manahan entered the Benedictine monastic order in 1945 and had been ordained as a Catholic priest in 1952. 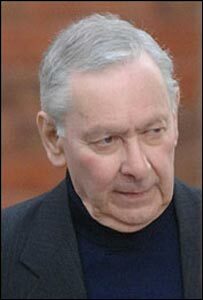 He was elected Father Prior at the abbey from 1968 to 1976 and again in 2003 but resigned the post when he was arrested. Prosecutor Ian Fenney said Manahan taught Latin, maths, English and religious instruction at the school and was connected with it until it closed in 1994. The court heard Manahan, known as Father Philip, had touched the boys under cover of his desk during classes, while watching television with them in the school's boarding houses and when giving them piggy-back rides. In sentencing, Judge Neligan said: "I am satisfied there was an element of grooming and favouritism among some of the boys you selected by giving them sweets and treats." The judge said it was impossible to calculate the "emotional harm" that had been done. He said: "The message must go out that those in a position of trust in schools must expect to go to prison if they prey sexually on children in their care." An investigation began in 2004 into sexual impropriety against one of the monks at the abbey, Paul Couch. Couch, of Wyndham Street West, Plymouth, was convicted in August of two serious sexual offences and 11 indecent sexual assaults against boys at the school and was jailed for 10 years and nine months. The offences came to light when a former pupil alleged that Couch had systematically abused him. The court heard that during the investigation, 700 questionnaires were sent out to former pupils of the school and disclosed sexual abuse by two of the monks. A Devon and Cornwall Police spokesman thanked the victims for their co-operation "in disclosing uncomfortable and traumatic experiences". In a statement following the court case, Buckfast Abbey said: "We all have been surprised, shocked and saddened to learn that these offences were committed and our prayers go out to all those affected and their families. "We have received many communications from a great number of former pupils stating that their times at Buckfast were happy and fulfilling and it is hoped that these findings will not tarnish those cherished memories." The abbey said the relevant authorities in the Church would now review Manahan's position.